A painting found in the stores of the Holburne Museum in Bath has been identified as being by Flemish artist Pieter Brueghel the Younger. The painting, titled Wedding Dance in the Open Air, was spotted by Jennifer Scott when she took over as the Holburne's director in 2014. It was previously thought to be the work of a copyist or follower. 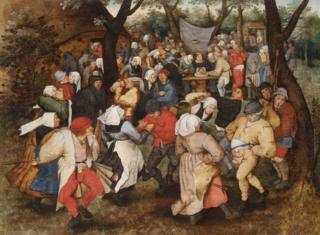 But it has been dated to 1607-14 and will be at the centre of an exhibition about the Bruegel dynasty next spring. Scott told the BBC Radio 4 Today programme: "It's one of those exciting moments - the dream of a museum director to find something and then take a chance, have the conservation work carried out and to discover that that hunch was correct." Brueghel the Younger was the son of Pieter Bruegel the Elder, who began an artistic dynasty that spanned several generations. The elder man is regarded as the greatest member of the dynasty and the younger Pieter largely painted in the style of his father, even copying many of his works. Scott said: "Unfortunately, Pieter the Younger is often thought of as a lesser Bruegel - I think perhaps because he had the misfortune of sharing his father's first name. "This gives us an opportunity now to look at his work and to see how he was innovative and really fresh in his approach even though he was often recreating the scenes that made his father so famous." Bruegel: Defining a Dynasty opens at the Holburne Museum on 11 February 2017.